Sōtō (曹洞宗; Japanese: Sōtō-shū, Chinese: Caodong-zong) is one of the two major Japanese Zen sects (the other major one being Rinzai). It is an extension or subbranch of the Chinese Caodong, which was brought to Japan by Dogen Zenji (1200-1253), and which after his death became known as the Soto school. It now has a significant presence in North America as well as throughout the West. With 14,700 temples and nearly 7 million adherents (in 1989) is the largest Zen sect in Japan, vastly surpassing Rinzai and Obaku. In Japanese history, Soto gained ground among provincial rulers and ordinary people, while Rinzai won the support of the central samurai government. Soto is practiced both in Japan and in the West, and stresses shikantaza, the meditation as a means of completely eliminating the mind and body as a conscious entity; enlightenment realized at the arrival of what can be considered ‘pure existence’. The characteristics of Soto as a distinct style of Zen go back to Shih-t’ou Hsi-ch’ien (J. Sekito Kisen, 700-790) who led an important practice center in the mountains of Hunan province in China. From this school there developed three different schools of Zen of which Soto is one, being founded by Tung-shan Liang-chieh (807-69) in China. Its transmission to Japan was done by Eihei Dogen Zenji (1200-1253). Similarly to the traditions of Tibetan Buddhism, a senior monk will be appointed to be a lineage bearer in a Dharma Transmission ceremony. This monk will have previously been acknowledged to have some degree of enlightenment or satori by a current Zen master, as well as having lived and served for some decades in a Zen monastery. 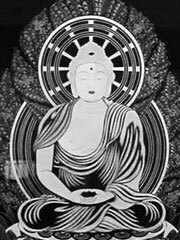 The lineage documents typically trace the chain of transmission back to Gautama Buddha, the original historical Buddha and founder of Buddhism. The larger majority of North American Soto priests, although including Japanese nationals, mainly those of American and specifically European descent, joined together in 1996 to form the Soto Zen Buddhist Association. While institutionally independent of the Japanese Sotoshu, the ] works closely with what most members see as their parent organization. With about two hundred fully transmitted priests, the Soto Zen Buddhist Association now represents nearly all Japanese-derived Soto Zen lineages in North America. Shih-t’ou Hsi-ch’ien’s poem «The Harmony of Difference and Sameness» is an important early expression of Zen Buddhism and is chanted in Soto temples to this day. One of the poems of Tung-shan Liang-chieh, the founder of Soto, is «The Song of the Jewel Mirror Awareness» is also still chanted in Soto temples. Another set of his poems on the Five Positions of Absolute and Relative is important as a set of koans used in the Rinzai school. Dogen’s teaching is characterized by the identification of practice as enlightenment itself. This is to be found in the Shobogenzo.